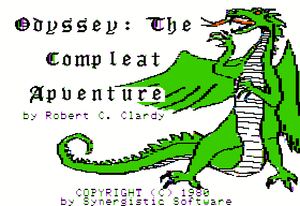 Odyssey: The Compleat Apventure is an adventure game written by Robert Clardy for the Apple II computer and published by Synergistic Software in 1980. The game was one of the earliest computer-based role playing games and incorporated features from Clardy's earlier Dungeon Campaign (1978) and Wilderness Campaign (1979). "First, about that title art with the dragon. I, too, cannot remember the source exactly. But, I can guess... I think it was Ron [Aldrich] that brought me the outline sketch for that dragon. I thought he had done it. He might have. Or, he might have 'found' it on the net. Both Eamon and Odyssey came out that same year, so I have no idea which of us got the art first. The difference in the tail, wing, and color, though, looks like me. I am a total hack as an artist. But, cut and paste, alter slightly, and such - that I can do. And, it was about then that I wrote a flood-fill feature for Higher Graphics and that was clearly used to colorize that sketch. As has been noted elsewhere, it was a different time then. Synergistic could not afford either employees or to hire real artists for original work. So, art was hacked. Today, hard to imagine actually publishing anything with such uncertain ownership..."
Odyssey allows the player to move his character around a graphical map of a large ocean island; a similar interface appears in Brown's adventure The Lost Island of Apple.